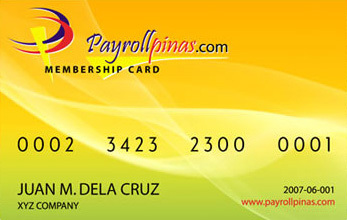 Payrollpinas.com legitimate subscriber are entitled to one Membership card, a Membership program that provides each customer added security to avoid fraudulent use of our system. This will help ensure a high level of security program that we implement aside from the regular username and password you create. A Membership card is issued to a member but as a provisional procedure, which will allow us to process your information to the membership card, we will issue temporary access pass. The ownership of a Membership cards belongs to Payrollpinas.com. A membership name and sixteen (16) digits number are shown on a Membership card. A Membership card cannot be used by anyone other than the member named on the card. Members should use and manage their Membership card and card information with diligence of a good management. Members are strictly prohibited from lending or transferring their Membership card to others, offering them as collateral, or allowing others to use our system. While using our web based Payroll system, our system will ask for a random numbers printed on the Membership card. If the user fails to provide the exact number requested by the system, the user cannot work on the system until meet the required security lock. Payrollpinas.com assumes no responsibility for any loss of whatever nature resulting from unauthorized use of your privilege to use our system. Payrollpinas.com is not responsible for any incorrect or inaccurate information, either collected at the time you registered as a Member or during the course of your subscription of the Program. This Membership card is not a debit, credit or billing card.